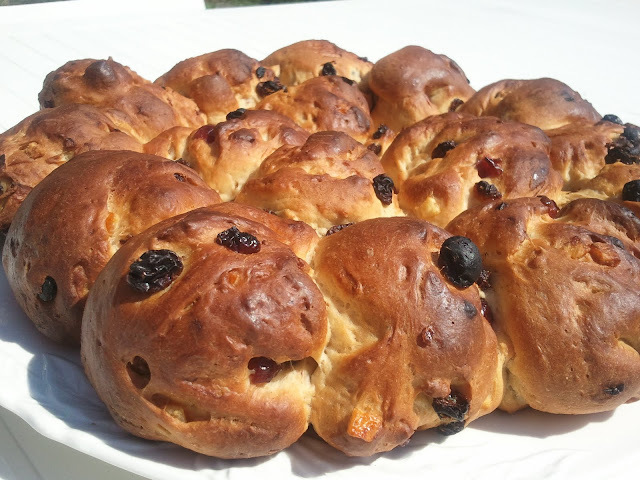 For brunch on Good Friday this year, I whipped up a batch of hot cross buns in the Thermomix. I used the recipe from the Everyday Aussie Thermomix Cookbook. The recipe is also here on chookie's blog. I left them in the rustic state, and omitted the flour paste for the crosses and the sugar syrup glaze. It takes a few minutes to throw in all the ingredients into the Thermomix, mix and then knead on interval speed for 3 minutes. The recipe in the EDC book has 2 pkts of yeast in it, so I did the fast rise in a cold oven, and they were perfect. They're filled with raisins, sultanas and cranberries. Loved the cranberries, I'll definitely make these again next year. We ate them outside in the garden, enveloped by the scent of the wisteria and the lilac trees. 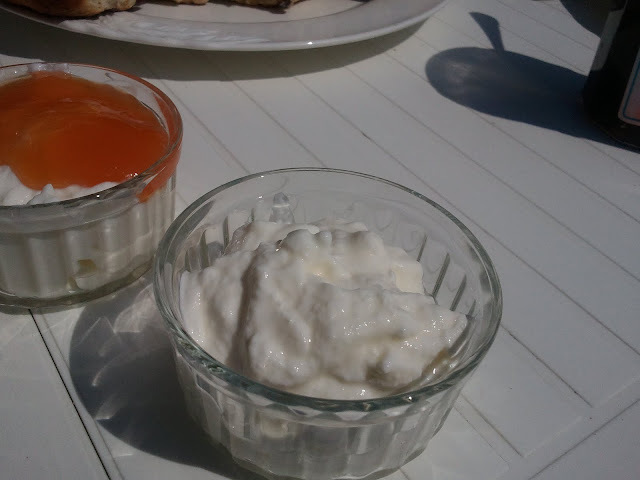 Our buns were followed by homemade yoghurt, topped with Wannental - or more aptly, Beat's, tangy orange pumpkin, ginger confi. 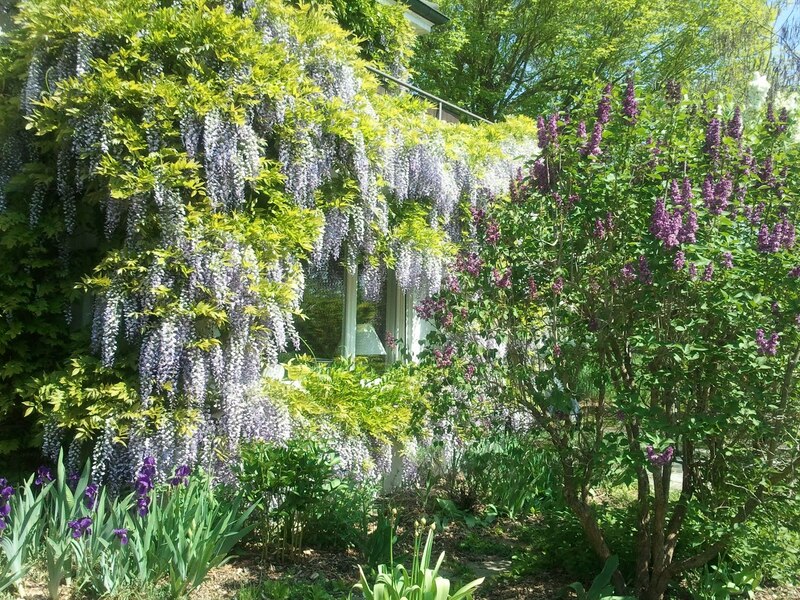 The Wannental farm is our favorite place to buy locally grown, homemade jams. I used the yoghurt recipe from the UK Thermomix site, and let it set in wide neck Thermos flask for about 5 -6 hours. The yoghurt was thick and creamy, and tastes nothing like the store bought stuff. Delicious!! Oh my, your garden looks beautiful! 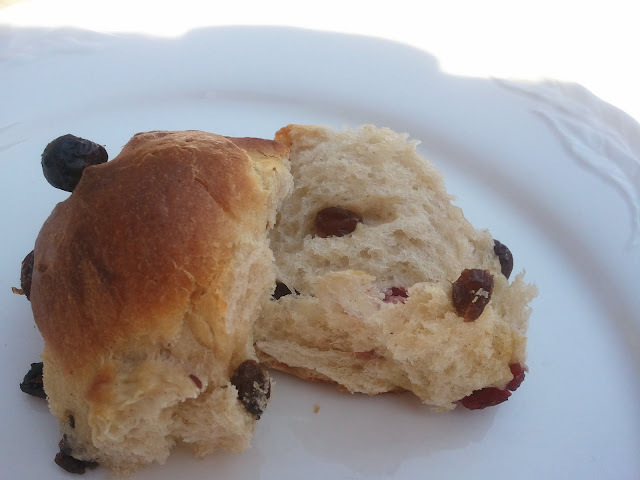 I enjoyed making hot cross buns this Easter too. Very curious about the confi - sounds very interesting and so different from anything I've had before. Thanks, yes our garden is absolutely glorious now, thanks to my green-fingered husband (and no thanks to me). Hmm, the pumpkin, orange and ginger "confi" is superb. I'll ask Beat if he'll share the recipe and I might try to make it in the TM.